The complete package includes all the necessary items for a great look on graduation day. 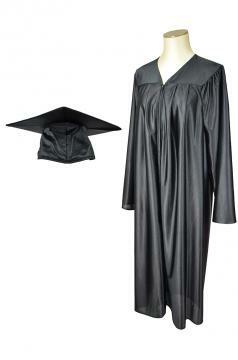 The package is composed of a gown, mortarboard and tassel. 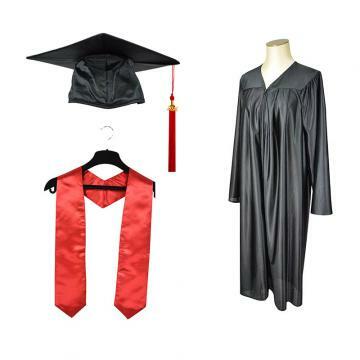 This distinctive graduation ceremony gown is made of 100% high quality, shiny polyester and closes easily with a zipper down the front. Vertical seams on each side of the zipper make for a nicely tailored look and comfortable fit for all. Several sizes available. This elegant and classic cap is designed to perfectly match our shiny gowns. It adjusts easily to any head size thanks to the elastic band in the back and the tassel is attached to a raised button located at the top of the mortarboard. Our attention to detail guarantees both a great look and perfect fit. The cap is one of the most iconic symbols of the graduation ceremony and becomes a treasured keepsake for the graduate for years to come. Inside each student can add his or her name and the date. The tassel is moved from the right side before the ceremony to the left side afterwards, symbolizing the student's passage from one chapter of life to another. Together with the cap, the tassel remains an important keepsake after the ceremony. 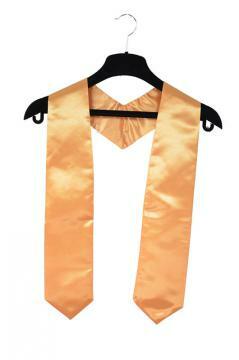 Our colourful stoles can be used to dress up the cap and gown or distinguish certain students. These can also be used with choir gowns. A logo or other imprinting can be added to one or both sides to further customize these (silkscreening recommended). Delivery within 5 and 20 days.